The new app comes to upgrade Samsung’s existing camera offering for Windows Phone 8 – which you can see in our review of the Samsung Ativ SE. It’s said to feature a variety of shooting modes. You can count on seeing things such as Beauty Face, Best Photo, Best Face, Rich Tone (HDR), Eraser, and Night Shot among its options. Smooth motion and slow motion are supported when recording videos, and it’s also possible to snap a static image while capturing a video. 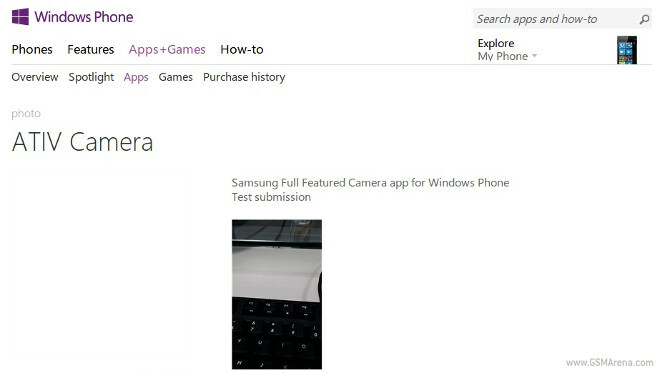 All in all, it should have an intuitive user interface building upon Samsung’s Camera app for WP8. The only problem with the new Ativ Camera is that right now it can’t be used. It will only work on Windows Phone 8.1 devices, and it reportedly depends on Samsung coming out with new camera drivers for its existing Windows Phones. That will presumably happen when the Korean company releases the official update to Windows Phone 8.1 for its handsets. Though since this app is already listed in the Windows Phone store, that rollout may be coming pretty soon.